One of the great things about taking courses in Graphic Design at Anne Arundel Community College is the tangential things they get you into. Of course Typography is an important part of design work, but I didn’t know I had an affinity for it until I took the class. I started a new font at work the other day! This is an exercise in hierarchy, we were given the text and asked to arrange it in a pleasing manner. I used Goudy Stout Regular for the headings and Goudy Standard Extra Bold for the main text. The choice of color was made to be as eye catching as possible. 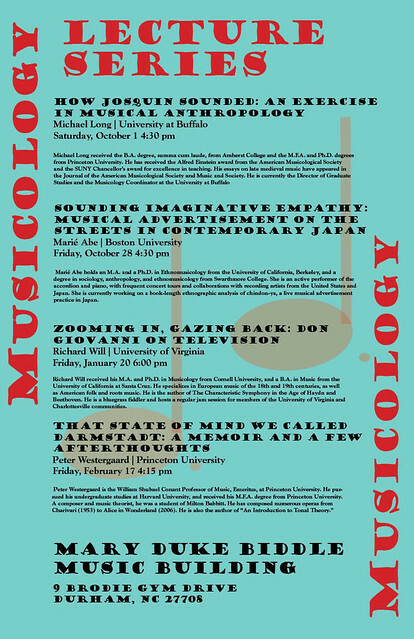 This entry was posted in Typography and tagged Lecture Series, Mary Duke Biddle Music Building, Musicology. Bookmark the permalink.